So while preparing a delicious, but not overly simple recipe from Amanda at Good Clean Food I was so impressed with the tofu marinade that I knew it was destined for other uses besides the Gingered Greens with Tofu that she shared. And if I lost you at the tofu, fear not…. what you choose to marinade or stir fry is between you, your doctor and the animals in your life 😉 Although I will say that tofu gets a bad rap with folks who’ve never tried it, the truth is that it takes on the flavor of what it is cooked in, AND there are ways to change it’s texture if you don’t like it as is (see notes at the bottom). 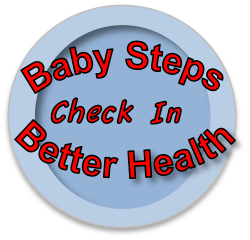 Bok Choy & Ginger and Broccoli – Oh My! One of the staples around here is stir fry. It comes out a little different each time because my approach is similar to that of refrigerator soup. Refrigerator soup is when you have a carcass with which to make soup and you add whatever happens to be in the refrigerator (or pantry) that has any business at all being in soup. So my stir fry is usually refrigerator / garden stir fry. I always start with some heat tolerant oil like safflower and sesame oil mixed together to which I add pressed garlic, fresh ginger and something from the allium family such as spring onions, leek, shallot, or onion. Fresh ginger is very different from dried and it tastes great, but it is very time consuming to prepare. Unless, that is, you use the Biggest Bro method. That is the same Biggest Bro who used to sneeze on his french fries so nobody would swipe them, but he cooks well and this is an awesome way to include fresh ginger – no bodily fluids involved. Buy your fresh ginger in the produce department – usually in the ‘odd, exotic or international’ section. 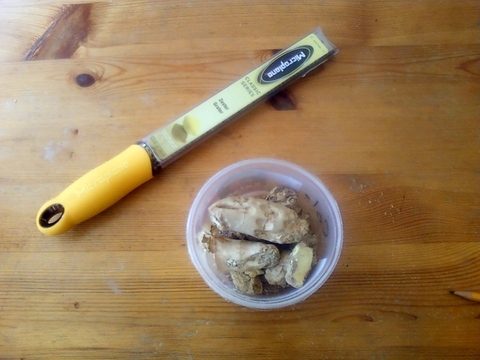 Freeze your fresh ginger. No need to wrap it or put it in a covered container, just stick that gnarly old thang in the freezer. Then when you want some you just grate it with a fine grater. Couldn’t be easier and still tastes great. For especially easy grating, I suggest the microplane that I received from Step Mother. She does NOT sneeze on her french fries, is an awesome cook and has some of the coolest, simple gadgets around. This is one of them. That is the uncovered tub I keep the ginger in because I did find I was having trouble finding it in the morass of nuts, flours and leftovers in my freezer. 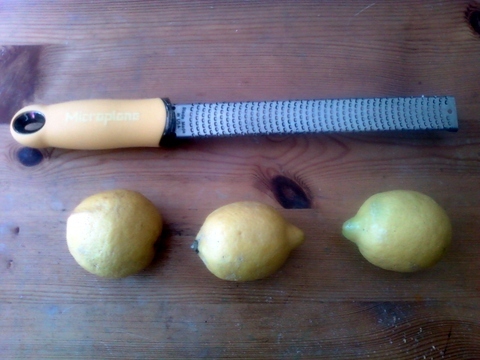 A microplane is a lot more expensive than your average grater (14.95 at Amazon) but it is unbelievably effective for this and lemons, parmesan, and other items needing grating. 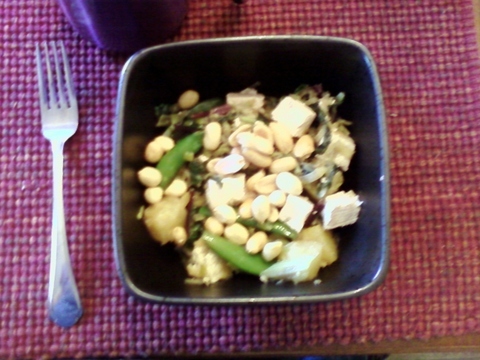 Anyhow, back to the refrigerator / garden stir fry. 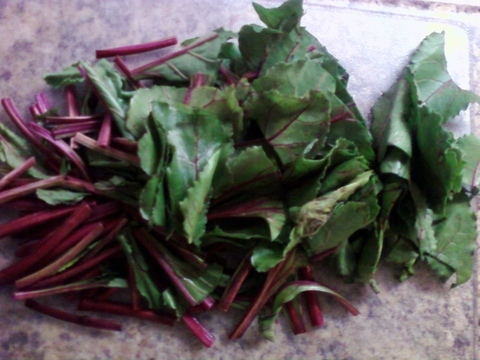 I had some swiss chard, some bok choy, and some beet greens in the garden, but not enough of any one of them for a single ingredient. So I took what I had of each. 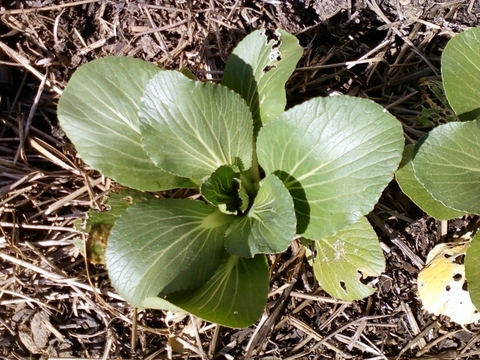 Here’s my bok choy. I also had some broccoli stems in the frig that I was saving for this or for broccoli cheese soup. Leeks purchased today (the garden leeks are coming….) in a group of 4, one ought to do it, saving the tops in the freezer to put in stock. 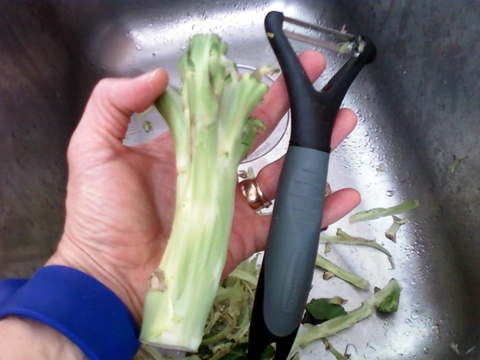 Now broccoli stems are a challenge. 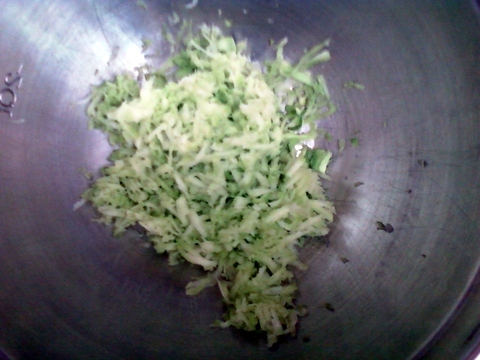 You can buy broccoli slaw in a package at the grocery (expensive but yummy) or you can shred your own with a little work. 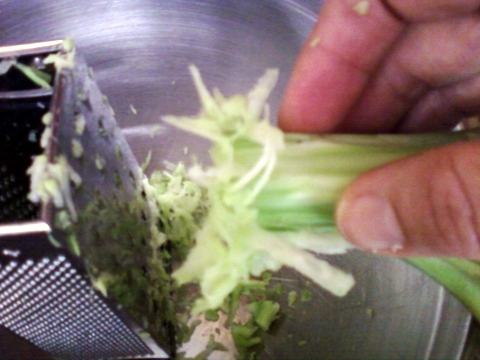 First, cut off anything downright objectionable, then use a vegetable peeler to take the outermost layer off. Then grate starting at the big end. 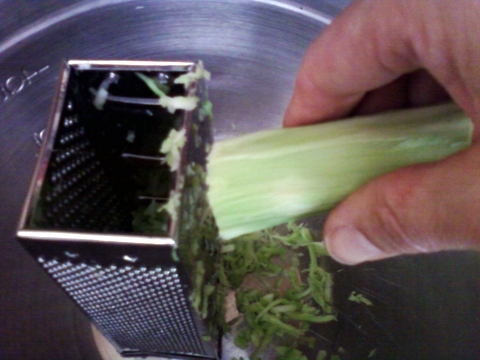 You will find that as you grate a tougher outer layer starts to hang on and doesn’t grate well. Just stop now and again, peel it off and continue grating. 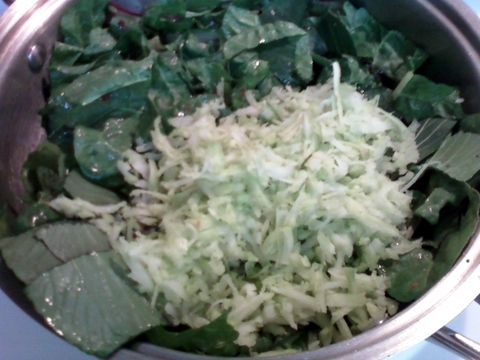 When you are done you will have a pile o’ shredded extremely healthy vegetable matter that goes un-noticed by broc-o-phobes. Once you’ve cooked your oil, garlic, ginger and allium throw in your greens cut into pieces, your broccoli slaw…. And whatever else (or any substitution) currently hanging around in your refrigerator like carrots, or peppers. Oh look! I have some snap peas! Toss em in there. I have tofu as well! Cube it – and toss it in. (Alternately you can cube and saute tofu first to make it a little crunchy or seasoned but this takes longer and makes the whole thing seem more planned.) 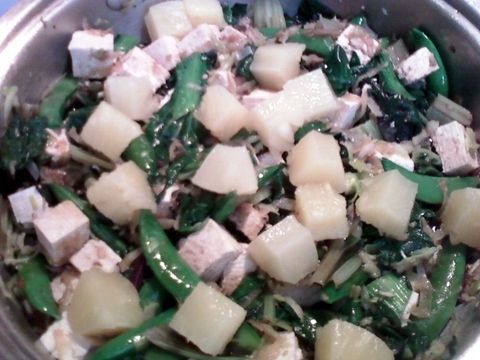 I love to add some canned pineapple and some Bragg’s liquid aminos which I substitute for soy sauce. I’m getting hungry. Better finish this post and go make a kale smoothie as my boy will be home from school any minute. 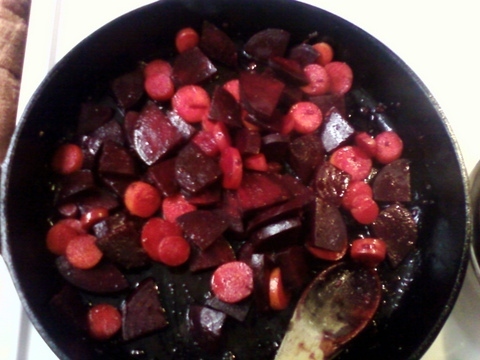 Lest you be fooled that I am truly reckless and carefree, this recipe does not vary too much except for the vegetables. And last but not least I add peanuts on top. Sorry the picture is a bit fuzzy but I can’t take another one because I ate it. And it was very tasty too. Have fun with the simple, fast and healthy varieties of stir fry you can make and tell us about your favorite combos!